The McDougall Diet is rich in whole food. The McDougall Diet is not new! It has been the choice of thousands of people around the world. It is a whole food plant based diet which is very effective for restoring and maintaining one's health. Dr. John McDougall is one of my heroes. 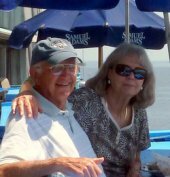 He has practiced "lifestyle medicine" for over forty years. He has searched for the truth to offer real healing medicine to his patients. Dr. McDougall started his medical career in 1972 on the big island of Hawaii as a plantation doctor for the Hamakua Sugar Plantation. As a young doctor, he soon found out that the drugs he passed out did not solve the health issues. He thought maybe it was because he was a lousy doctor. Then, his observation of the diets of multiple generations from the far east that worked on the plantations changed his life forever. His first patients on the island were always trim, hard working, were active into their 80's and 90's, did not have high blood pressure, prostate cancer, breast cancer, colon cancer or heart disease. They lived primarily on a whole food plant based diet of rice and vegetables...the diet they brought from their homeland. Their children and grand kids all consumed the Standard American Diet (SAD) and they became fat and sick...then fatter and sicker! This early observation had a profound effect on his future practice of medicine. In 1976 he attended the University of Hawaii Medical Residency Program to become a board certified internist. Dr. McDougall felt that this was the only way he could effectively practice "lifestyle medicine" and really help people. For more than 20 years he has run a very successful 10 day live-in residential program located in Santa Rosa, California. He has cared for and witnessed thousands of patients over the years recover from illnesses with a whole food plant based diet and exercise program. Individuals turn to Dr. McDougall for solutions when modern medicine is unable to offer any remedy to their health issues. Regain your health and lose the weight for good! He is the author of many national best sellers about dynamic health, maximum weight loss, a program for a healthy heart and a program for women...to name a few. 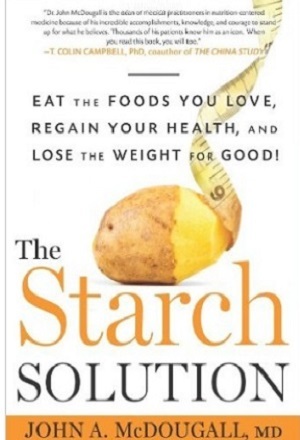 One of his best books is "The Starch Solution". Dr. McDougall is a true pioneer in the whole food plant based diet and lifestyle which has come to be known as the McDougall Diet. He continues to confront the ineffectiveness of the so called "modern medicine" on all fronts. He is the "David" that takes on the "Goliath" of the medical-industrial complex. The proof of the truth of his ideas is found in his many patients that have been able to live and enjoy abundant life on the McDougall Diet through the consumption of whole foods and his plant based healing program. The world owes much to this pioneer. The main theme of this whole food plant based diet is complex carbohydrates. On the McDougall Diet you will consume 70 - 90% carbohydrates. There are very small amounts of carbohydrates in red meat. poultry, fish, shellfish or eggs. Most dairy products are deficient in carbohydrates...but ALL plant forms contain carbohydrates. Only complex carbohydrates are permitted because of their special characteristics that provide a slow and methodical digestive process that provides the bloodstream with long lasting energy. These pastas play a very small part in The McCougall Diet since they are made with highly refined flours. These noodles are also made from highly refined flours and should be minimized in The McDougall Diet. 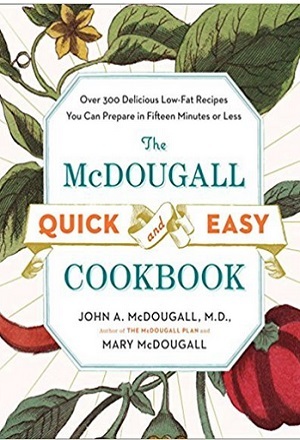 Dr. McDougall's soups have become our healthy fast food. We always keep some on hand. 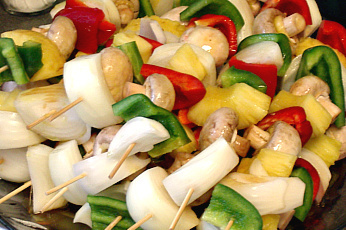 Serve them with a salad, a sandwich or steamed vegetables on the soups with noodles...so delicious! Click here for this product. On the McDougall Diet, you may add as many green, red, yellow or orange vegetables as you wish to a meal since they do not contain many calories. Fruits should be limited to three servings a day. The sugar in fruit is fructose, which can cause triglycerides and cholesterol to rise in some people. People with these concerns should restrict fruit even more. Fruits and vegetables are too numerous to list. Non-caffeinated Herb Tea, Cereal Beverages, hot water and lemon, Mineral water, Flavored or plain Seltzer Water. Need ideas to get and stay healthy? The McDougall Diet also includes exercise. Diet alone will take you a long way to achieving excellent health, but if you are able to exercise, the benefits will further improve your fitness and well being. Exercise as simple as a daily walk will give you increased muscle tissue, loss of excess weight, more energy, improved digestion, better mood, higher HDL, lower triglyceride and blood sugar levels, a fall in blood pressure and a more appropriate appetite. Getting a blood test to measure the levels of cholesterol, triglycerides, glucose, BUN, uric acid, and everything else that your doctor may think important. Cholesterol level: If your total cholesterol is above 180 mg/dl, it may be a warning of potential circulatory problems. Ideal is below 150 mg/dl. Triglyceride level: this measures the amount of fats floating around in your blood. It should be between 50 and 200 mg/dl. Higher levels cause insulin resistance and is associated with an increased risk of heart disease.